The history and evolution of marketing in open source demonstrates a need for new approaches. For example, commercial marketing teams often measure success with leads. They focus on the buyer persona. OSS marketing, in contrast, seeks to appeal to many more, and more diverse, stakeholders. Developers, maintainers, vendors, and end users are all critical to sustaining the OSS marketing effort. You can't visualize engagement with these stakeholders in a funnel or measure it with ROMI. But without their engagement, OSS marketing efforts will fail. The evolution of OSS, from commoditizing established markets to innovating in brand new markets, means that the approach to marketing OSS today also must evolve. Two models help explain how different marketing is with today's innovative OSS versus marketing OSS in established markets. When MySQL emerged, the entire enterprise market already used databases, so no awareness-generation activity was necessary; people already understood the uses or benefits of using databases. MySQL could focus instead on convincing users that OSS wasn't only for geeks; indeed, many enterprises were already using MySQL without IT management’s knowledge. These users saw the same, if not superior security, performance and scalability results. Awareness Grassroots. Departments start using it, realize first-hand it’s high-quality and word spreads. Coordinated outreach through broad channels (blogs, social, events, media), leveraging early adopters and backers to amplify messages and raise awareness and understanding. Affinity Performance based on internal use. Seek reassurance that OSS is “enterprise-ready.” Engage with early adopters to develop industry-specific requirements, use cases and project-market fit. Technical education (white papers, etc.). Trial Tech trials already occurred. Persona-based digital strategy to deliver user-friendly trial experience. Create platform for users, developers, and vendors to interact. Adoption Cost/performance comparison to proprietary incumbents. Extend platform to include marketplace of ecosystem offerings for users seeking a full solution. Promote training programs and community job boards to ensure end users have access to talent. 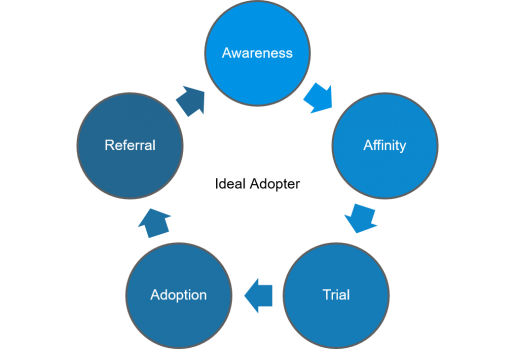 Referral Grassroots approach ensures viral word of mouth from inception. Case studies for commercial solutions. Work with early adopters on case studies and other testimonial programs. 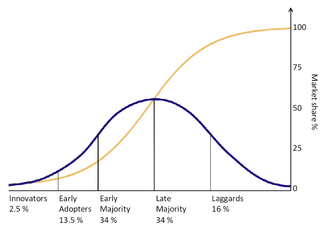 To examine the second model, let's look at the technology adoption curve. In the mature database market, for example, everyone was already using databases when OSS options emerged. Consensus relies on shared goals and values and broad agreement. Working toward consensus helps clarify, refine, and crystalize shared values and goals. It reminds all parties that they have a voice in shaping those goals and values. That’s why the path to achieving (near) consensus matters. Seeking opinions, even critiques, invites the community into the work. It’s unlikely you'll achieve a state of complete agreement among all parties, but that’s not the point, nor should it prevent a project from trying to reach consensus. Open source marketing builds consensus on objectives, communications, and content strategy across varied project stakeholders—rather than mandate marketing objectives or plans from the outset. One can see the wisdom of the crowds play out in the number 80, for example: the average number of comments on a Node.js pull request tagged as "significant." Eighty backs-and-forths, 80 times to build off of another person’s thinking. Eighty times to be a little wrong and a little right. Quality code emerges through the interaction of the community. One community-generated content example is the Node Foundation's Enterprise Conversation podcast series. This program highlights how companies like Netflix, Lowe’s, SkyCatch, Twitter, and Google use Node. The massive Node community also engages in the Node Collection on Medium. Three volunteers edit this blog, and more than 30 volunteer writers drive more than 2,000 average unique daily visitors. Consensus-building and harnessing the power of the full community are investments that deliver outsized returns in engagement and growth over time. Sarah Conway - Sarah is Sr. Director of PR Services at the Linux Foundation where she works with several large, growing open source communities like Kubernetes and Node.js to create high-impact communications programs. Sarah has been involved in open source since 2004 and joined The Linux Foundation five years ago. She enjoys working with entrepreneurs and developers passionate about telling their open source success stories.